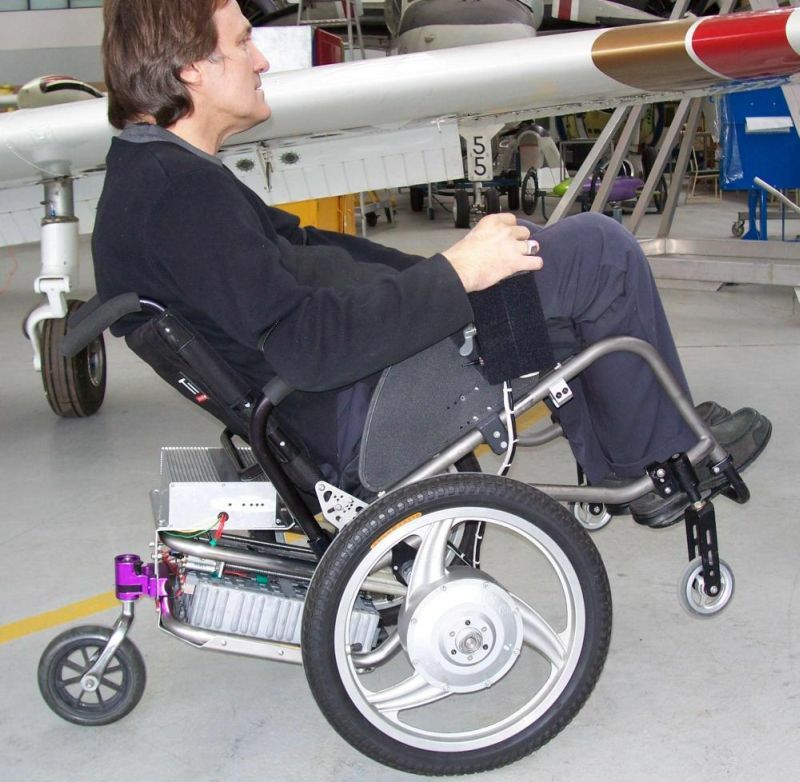 This version of our electric power wheelchair is based around a standard TiLite titanium manual sportschair frame with the addition of a three wheeled power module. 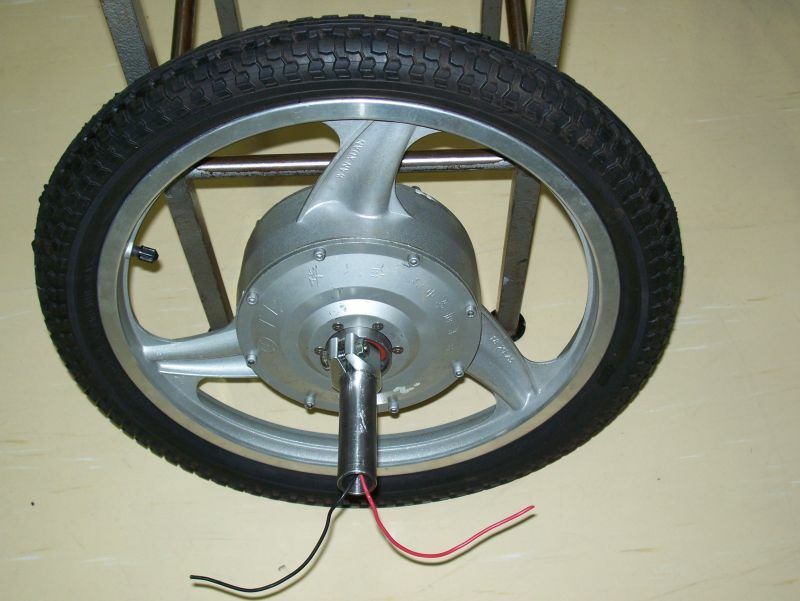 Allowing shortening of the wheelbase for indoor maneuverability, or electrically extending for outdoor cruising at speed this vesion uses prototype hub motors with rare earth magnet motors supplied by collaborators CATEA of Georgia Tech in Atlanta USA and NiMH batteries (the same as used in electric vehicles) supplied by sponsor Cobasys of Michigan USA . 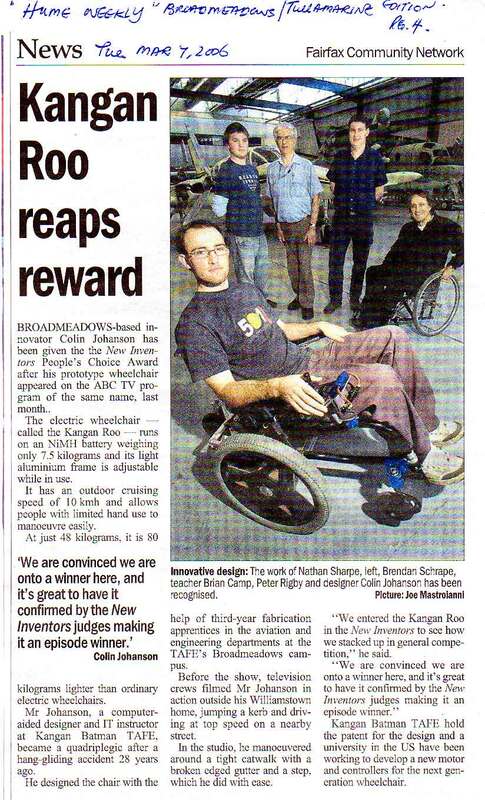 At only 44 kg or 103 lbs total weight, including high tech NiMH batteries and able to mount a 150 mm or 6" step independently, this versatile design shows what a 'sports power chair' could look like and yet be able to revert to a manual chair at times when power is not required. This becomes the pivot and thrust point of the front seating structure without changing it from the comfortable 24" wheel setup of manual mode. By applying only forward thrust to the same balance point as in manual configuration, but most importantly without frame torque that tends to wheelstand chairs with power wheels, I should perform like a maual sports chair but not try and tip over on acceleration. Add a power unit using light weight modern design battery pack made of four 12V 8.8Ah S1000 Cobasys modules such as used in hybrid electric electric vehicles like the HEV Prius. This gives a resultant 24 Volt 17.6 Amp/hour battery system weighing only 9.6 kg (21 lbs) that can be safely used 100% of capacitity as NiMH batteries actually like being flattened. Unlike lead acid batteries, which decrease their life and suffer problems like sulphation when discharged over 50%, NiMH batteries can safely deliver large power rates for almost all their charge and they are not damaged by full discharge. Although these batteries are tough and can be recharged in as little as an hour, a special NiMH charger is required. I use one that can charge half the pack (needed as there are two sets of series connected batteries in parallel) that only weighs under one kilogram (2 lbs). Will need to develop a more powerful charger with correct switching. NOTE: These batteries are not available retail as they are only supplied to OEMs. These were then combined into a drive unit that also has an electric drive to move the centre pivot point, thereby lengthening and shortening the front wheelbase. 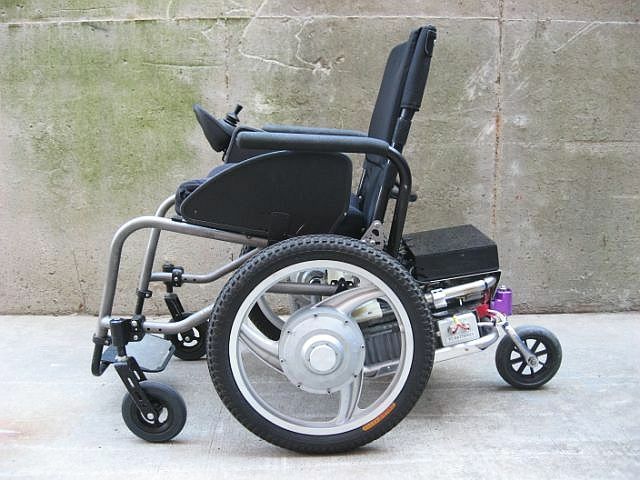 The main problem of front casters is mounting thresholds and this can be overcome by this design allowing the seat frame, with attached front casters, to be tilted by simple body weight shift around the rear pivot point. 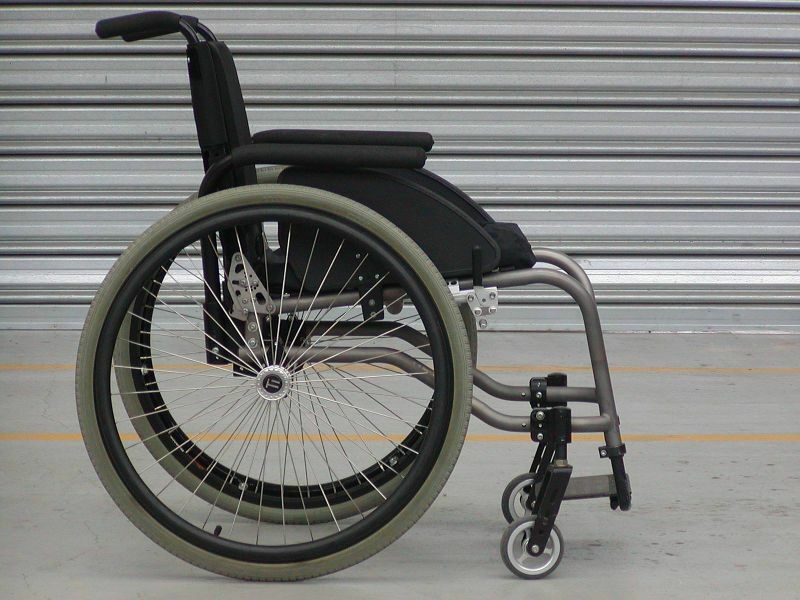 The rear frame, having the mid-drive wheels and the rear caster fixed into a stable support structure, is able to safely support the chair frame and occupant and be easily driven in this configuration of a 'wheelie'. 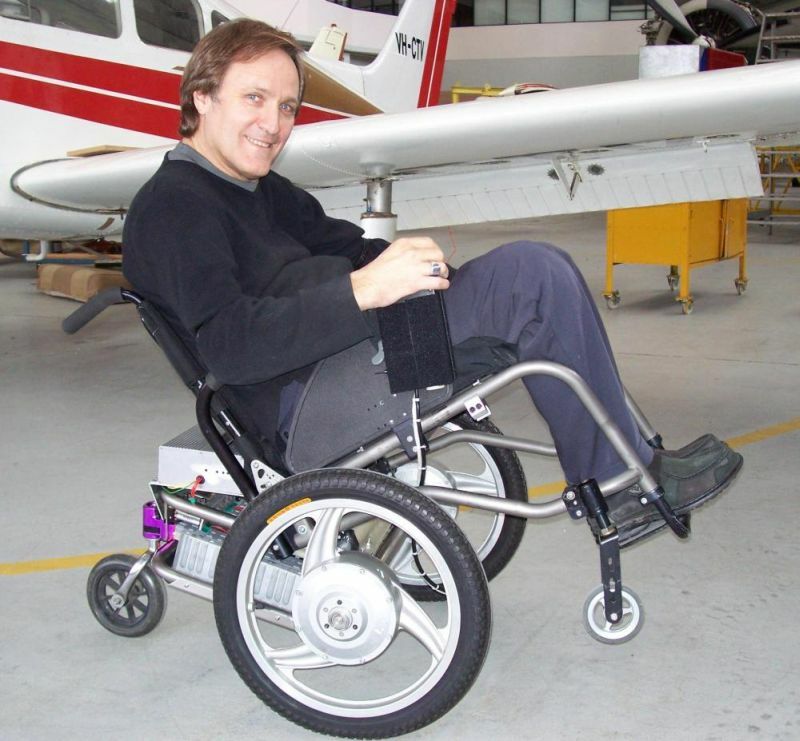 This allows the powerchair to be driven at a threshold with the front casters freely raised off the ground enabling the casters to be over the top of the threshold and when the drive wheels contact the threshold, forward inertia rolls these wheels up and onto the threshold and at the same time inertia of the occupant drops the front casters onto the top of the threshold. The rear caster, which is larger than the front can then be easily pulled up the threshold. By using inertia rather than brute motor torque to pull the drive wheels up the threshold, gives a much safer mounting. The problem of using tire grip to pull a powerchair up a step/threshold is that one wheel may grip and mount while the other slips. This can tip a chair over sideways as one main wheel ends up on the step while the other remains below. Another advantage of the body weight shift rearward tilt onto the rear wheel support frame is that it allows a simple tilt-in-space function, giving a very comfortable fifteen degree tilt for relaxing, weight shift, and easy rearward seating shift that retains the correct seated posture rather than promoting slumping caused by hitting small bumps. The main aim of this project was to test light weight compact batteries, light and efficient hub motors, and light small frame components as a unit to create a light weight, aesthetic sports powerchair. 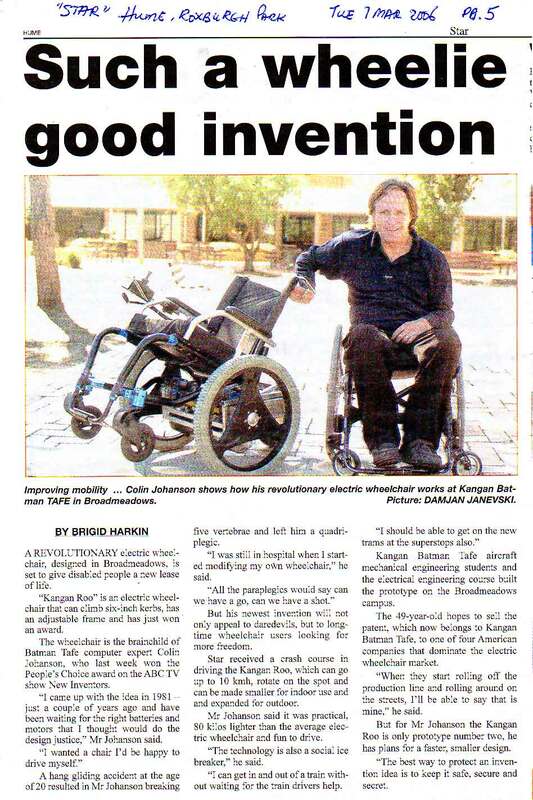 With an all up weight of only 44kg or 97 lbs a significant weight advantage over conventional powerchairs. Weight has long been attacked in the manual, especially sports chair market, where it makes the chair more easily propelled and lifted for transportation. 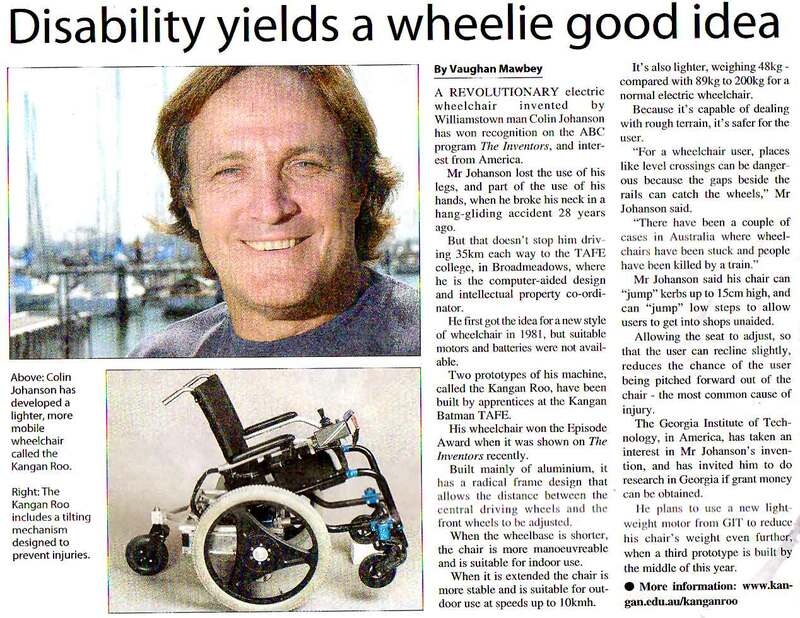 The question as to why this same approach to powerchairs had not been followed was challenged by this project. In automobiles it is accepted that power to weight ratio determines much of the performance, why has this seemingly been ignored by powerchairs? Battery technology has advanced to where the conventional power storage of lead acid batteries should be critically examined. NiMH batteries are now better sealed, have far superior storage density, can be rapidly recharged, actually like being deep cycled in contrast to lead acid, and have much greater numbers of recharges before decreased efficiency. Despite their greater up-front cost the probability of greater than three years life in continual use for NiMH batteries in contrast to a one year life for lead acid batteries allows likely cost recovery. 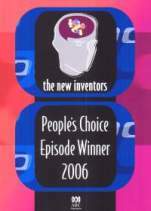 Add to that the better recharge rates of NiMH batteries which allow rapid charging in as little as one hour (versus 8-14 hours for lead acid) and the fact that regenerative braking is generally wasted as heat in lead acid batteries due to their inability to adsorb the charge fast enough, whereas NiMH can adsorb more of that charge. Permanent magnet motors, with iron magnets, brushes, armatures and worm drives are known to be rather inefficient. 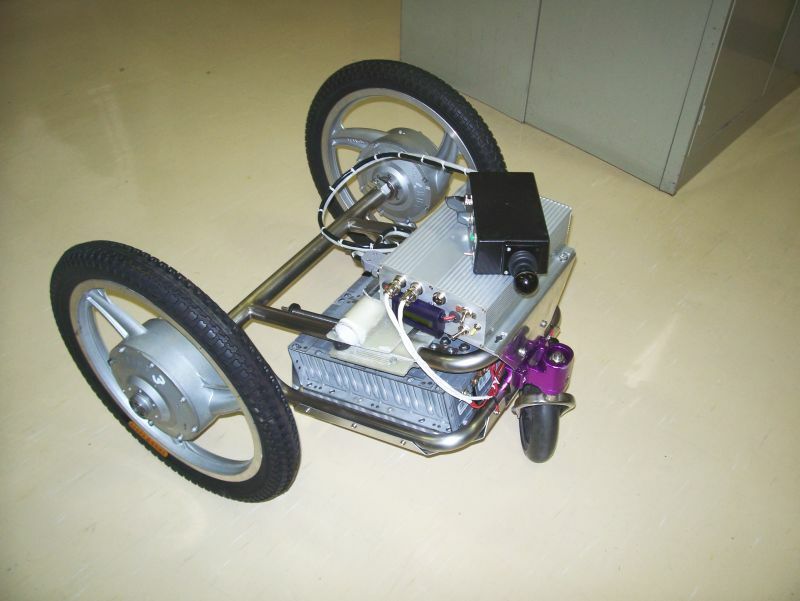 Brushless motors, using rare earth magnets and lower ratio straight cut gears are much more efficient and, especially when incorporated into the actual wheel hub we found to be significant lighter. Light weight, strong, yet flexible frames made of titanium have become the benchmark for manual chairs so I decided to assess the suitability of titanium to powerchairs. To see how efective the final product performs, see it in action in the following video and be amazed! View the following video (on YouTube) or download the full movie file (7 MB) to view anytime. Click centre arrow twice to view.